Jupiter is currently visible as a morning object. From Cambridge, it is visible in the morning sky, becoming accessible at around 00:52, when it rises 7° above your south-eastern horizon. It will then reach its highest point in the sky at 04:29, 24° above your southern horizon. It will be lost to dawn twilight at around 05:39, 22° above your southern horizon. Jupiter is the fifth planet from the Sun, orbiting at a distance of 5.20 AU once every 11.86 years. It is the solar system's largest and most massive planet, with 2.5 times the mass of all the other planets combined, and over 300 times that of the Earth. Its radius is over 10 times that of the Earth, but despite this, it rotates on its axis at phenomenal speed, completing one revolution every 9.9 hours. Jupiter is a gas giant planet, composed mostly of hydrogen and helium. It does not have a solid surface and is comprised almost entirely of gas, though it may have a small solid core at its center. Within this gaseous atmosphere there are thick clouds of tiny solid crystals, predominantly of ammonia. It is these clouds which make Jupiter opaque and determine its visual appearance. These clouds are highly varied in color, meaning that Jupiter's disk has the greatest color contrasts of any of the planets. The pale-colored bright zones represent up-wellings of warm material, and the clouds tops of these zones are at higher altitude than those of the darker belts that separate them. The dark belts appear to comprise of cooler sinking material, and it is believed that their deep red color stems from the interaction of the Sun's ultraviolet light with molecules dredged up from deeper within Jupiter's atmosphere by convection currents. While chemists refer to these molecules as chromophores, this is merely a generic term for any brightly colored compound, and the precise chemical composition of the chromophores present in Jupiter's atmosphere is not well understood. The planet's rapid rotation drives weather systems which mean these rising and sinking regions predominate at alternate latitudes, in much the same way that the Earth's trade winds form. This creates Jupiter's familiar striped sequence of bands. The two centre-most dark belts, closest to the equator, should be immediately apparent in even moderately poor seeing conditions. These are the North Equatorial Belt (NEB) and the South Equatorial Belt (SEB). On the southern edge of the SEB lies the famous Great Red Spot (GRS) which, when is readily apparent even in poor conditions. Jupiter's large angular size of up to 55" is rivalled only by Venus, and makes its disk quite apparent even through a modest pair of binoculars. Its rapid rotation, however, makes long-exposure imaging tricky. Modern image-stacking software such as AutoStakkert not only use lucky imaging – selecting frames from long video sequences with the best atmospheric conditions – but also correct for the fact that the planet may have rotated over the course of the observation. Jupiter comes to opposition once every 399 days – its synodic period. Where it lies in the sky affects how easily it can be observed from the northern or southern hemispheres, and because, by definition, it lies almost directly opposite the Sun at opposition, there is a close relationship between the time of year when Jupiter comes to opposition, and how well placed it is for observation. When Jupiter comes to opposition in the northern summer months, the Sun is high in the northern sky, which places the opposite side of the eclipic plane in the southern sky. This means that Jupiter is poorly placed for observation from the northern hemisphere when at opposition in the summer. Conversely, if Jupiter is at opposition in December, it is sure to be high in the northern sky. 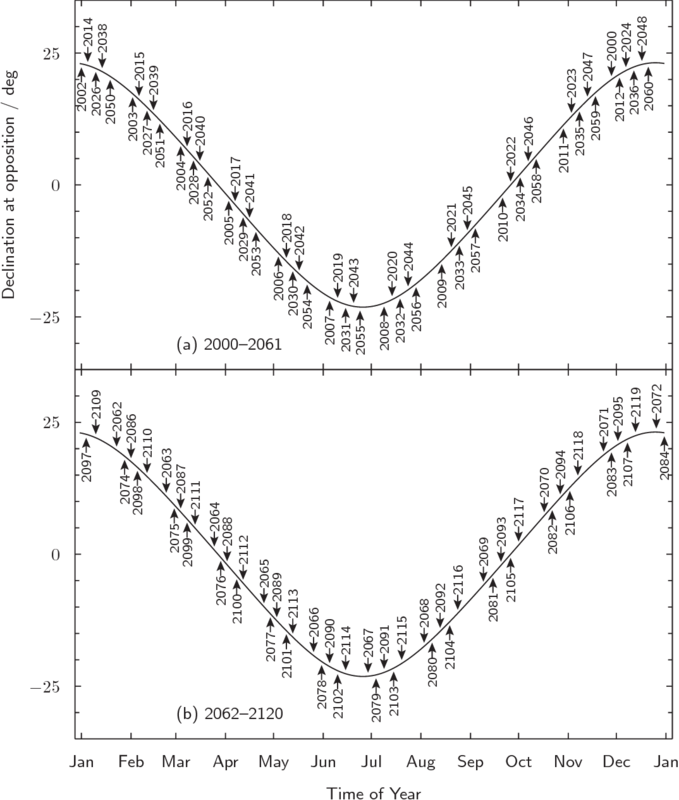 The chart below shows the time of year of all of Jupiter's oppositions between the years 2000 and 2120, together with the declination that Jupiter will have at the time, measured on the vertical axis. A chart of the time of day when Jupiter rises and sets on any given day of the year can be found here. A chart of Jupiter's path relative to the background stars can be found here.